No job is too big or small! We pick up refuse daily 7 days a week from the West End and City of London. We offer cheap rates and reliable, secure handling of your waste. 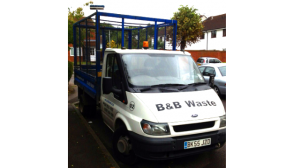 B and B Waste is a family run business and we are fully licensed & insured. Bags are supplied, and we offer regular or one-off collection of rubbish from private and business premises. Waste is handled securely and confidentially. Business premises waste collection from: Shops, Offices, Pubs, Clubs, Hotels, etc. Private premises waste collection from: Gardens, Houses, Garages, Lofts, Sheds, Flats, etc. B and B Waste will make it easy for you to recycle allowing you to minimise your carbon footprint and do your part to help protect the environment. We offer regular collection of mixed and paper recyclable products. We can also assist you with your commercial cleaning and maintenance needs. For more information please visit www.supremecleanuk.com.